Happy New Year, folks! I hope you guys had a great new year. Mine was relatively quiet, matched with a glass of champagne. Anyway, I’m here to share with you one of the things that I love about the year that has passed, Emerald Garden’s Sesame crabs. The crabs was introduced to me by a friend a couple of years back and I’ve been longing to eat it ever since. 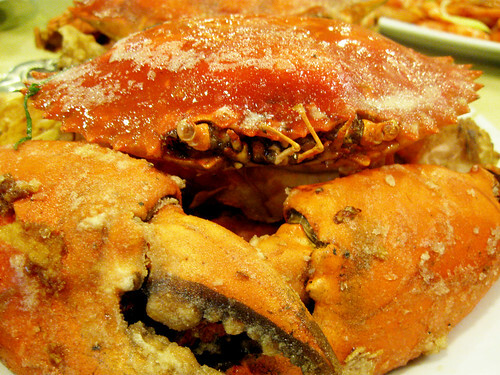 The crab is cooked simply, seasoned only with some salt and sesame oil. What I love about it is how the shell has this lingering saltiness that permeates to the flesh inside. I love how even my fingers taste like the crab when I give it a lick. My favorite part is the crab fat under the shell. It’s fried to a crisp and it’s strangely light to taste buds. So far, I haven’t felt my heart wrenching after eating the crab. It’s such an amazing crab that I long to eat it every time I’m in Emerald Garden. It’s a little costly, costing around 800/crab, but the crab is big enough to feed a group of 4. Next time you pop by Emerald Garden along Roxas Boulevard, make sure to order some Sesame Crabs! Just across the US Embassy.